At Your Community Yoga Center, we are a group of dedicated teachers and practitioners who believe that Yoga should be fun, healing and ultimately transformative. Classes are offered in a range of levels and styles so you can craft the practice that's just right for you. Retreat from your everyday life, journey into tranquility and well-being. Your nervous system will relax, your adrenals be restored, your organs will be nurtured. Includes deep relaxation, healing breathing, and meditation. We have a philosophy that sets us apart from other studios in the area. Read about how we got started, get to know our instructors, and meet our community partners. Kidding Around Yoga Family Fun! March theme – Somewhere Over the Rainbow, Parachute Pranayama. Faces light up, as children sing, jump, strike poses, and play musical yoga games. We have a range of styles and levels of challenge available. Browse our schedule, see class and workshop descriptions, and learn about our teachers. Once a month we offer deep sound healing & relaxation, starting with stimulating Kundalini Yoga and followed by an extended deep relaxation to therapeutic gong vibration. See a map of our location, get directions, and have a virtual peek at our two beautiful studios, and learn about how you can rent space in our fabulous firehouse. There's always a warm welcome when you check in at our bookstore counter! 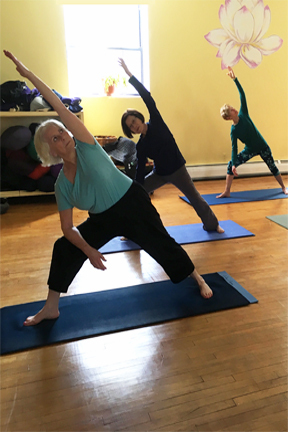 We offer 35 classes a week, from early morning to evening, and our highly trained teachers are members of the local community – a diverse group with thousands of collective hours of training in a variety of styles. In addition to our open classes, we hold Yoga Teacher Training programs for both adults and kids, and special workshops. We are partnered with other small businesses in the area to help foster growth and support our neighbors and have recently celebrated 10 years of serving our community. Our studio is maintained at a comfortable temperature (we are not a hot studio, although we do offer a few hot classes too!) and you will find our teachers, staff, and students warm and welcoming!